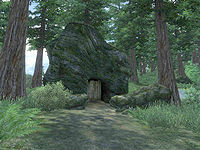 Felgageldt Cave is a medium-sized cave between Imperial City and Skingrad containing bandits. It contains two zones: Felgageldt Cave and Felgageldt Wishbone Vault. This cave contains 76 Cairn Bolete plants and 62 Wisp Stalk plants. This location's map marker (M on map) is named Felgageldt Cave (editor name FelgageldtCaveMapMarker). The entrance door is ESE of the marker, 40 feet away. Upon entering, proceed through the first chamber and follow the tunnel to a larger room. Follow the northern tunnel to another room, with a chest in the corner. 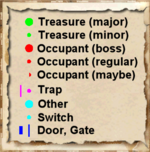 Proceed north and reach a room with multiple options. 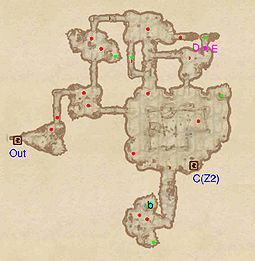 Choose the first tunnel to the south for a chest containing potions and then backtrack. The tunnel leading east is a dead end, so locate the last tunnel and follow it south. Make a left turn at the intersection and head east until you reach a semi-large room with another enemy and a tempting pumpkin sitting on a locked chest in the north passage. Go for it, but avoid the pressure plate trap at E, triggering the swinging mace trap at D.
To the south is a large chamber; take an immediate left for yet another chest. Stay on the upper level until you reach a tunnel to the south. Follow it and search the chamber for goodies scattered around the bandit camp; two chests, a bedroll at b, three bottles of cheap wine and two iron daggers. Backtrack and drop down the hole in the large chamber. A tunnel here will lead you to door C, which takes you to the next zone, Felgageldt Wishbone Vault. This next zone is more or less one big room, but it contains an easy-to-get boss chest, so it is definitely worth exploring. Immediately after entering from door C, you will find what is obviously a bandit camp, complete with bedrolls at b, a campfire and, most notably, two unlocked chests at b only guarded by two bandits. Jump to the upper level and do not bother exploring the surrounding area, as there is nothing to be found. Proceed to the next room where you will find quite a few valuable items; an iron claymore, a flawed pearl, a flawed topaz and a few lockpicks, only guarded by animals. Best of all, the boss-level chest is right nearby at B and is unlocked. After looting the chest, you will have to backtrack to door C to reenter Felgageldt Cave.